Mary Colter may well be the best-known unknown architect in the world. Her buildings at the Grand Canyon National Park, including the Watchtower, Hopi House, Bright Angel Lodge, and numerous others, are admired by almost five million visitors a year. The remarkable career of a woman in a man's profession during the late 19th century was the subject of a Friends' lecture event held October 25, 2002. → More about Mary Colter, images of her work and the Mary Colter lecture event. The Friends of 1800's conference, Looking Back and Forward, explored definitions of GLBT neighborhoods and the built environment. 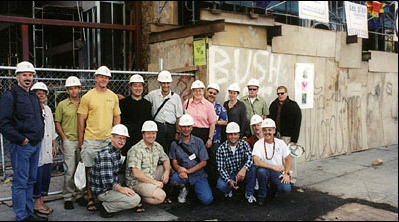 The Conference investigated the role of GLBT preservationists in the restoration and revitalization of our urban centers and focused on identification, interpretation, documentation and strategies to save significant GLBT places. → READ MORE.